The GreenisFGR-8800 DC Motor Vacuum Blender is the first blender in the world to utilize DC Motor technology in a commercially certified blender that was designed for heavy-duty use in juice bars, restaurants and cafes to make the perfect blend every single time without loosing torque under load. This is the first affordable High Power DC motor available on the market that has many advantages over your standard AC powered motor as found in Vitamix and Blendtec blenders. These blenders will reduce their speed and even shut off when you are blending thick mixtures. This will not happen with the High Power DC motor that will not loose power or overheat under load. It can even be used for up to 60 minutes of continuous use. Coupled with the power of the DC motor, the vacuum lid enables you to preserve the most flavor, colors, texture and nutrition in your blended creations by removing the excess oxygen in the container before blending. Your smoothies will never taste more flavorful. You soups and sauces will retain a more bright and vibrant color without the heavy separation that traditional blending offer. Using the Vacuum Blending Lid is optional, which means you can still make all of your favorite soups and hot drinks in the Greens FGR-8800 without using the Vacuum Lid accessory so that you can use the tamper to make super-thick mixtures that do not contain high amounts of liquid. 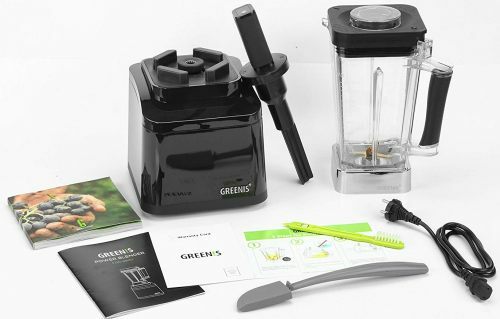 This makes the Greenis FGR-8800 an extremely versatile blender, and allows you to prepare numerous recipes and is the ideal tool for today�s nutritional needs � gluten-free, vegetarian, vegan or raw vegan and much more. It�s also silent and sturdy which makes it perfect for your home kitchen or commercial establishment. By incorporating brushless DC motor technology into their smart power blenders Greenis has produced a product with unmatched power and durability. The FGR-8800 also has advanced features such as touch-screen interfaces, intelligent programming and Bluetooth connectivity. The exceptional characteristics allow for efficient, innovative and powerful preparation of all types of produce. Greenis has been positioned as the new benchmark in power blending. Smoothies, juices, purees crushed ice and all types of blending will be quick and easy. The Greenis Commercial FGR-8800 blender is the first NSF commercial certified blender that uses an innovative DC motor. Unlike all other blenders on the market (Vitamix, Blendtec, Nutrabullet, Ninja, Breville, etc) that use an old-fashioned AC powered motor that will loose power under load, the Greenis DC motor will maintain its speed under load that will allow you to blend even the thickest mixtures that may cause other blender to overheat and shutdown. This innovation also saves up to 40% electricity over traditional AC blenders. Due to the brush-less DC design, it is 20% more quiet and has a 10x longer life. This sealed DC brushless motor also stays cooler without and you can run it for up to 60 minutes at a time. Don't try that on AC blender. Greenis FGR-8800 blender is teamed with a blade assembly containing 4 Cross shaped blade. The shape and angle are precisely engineered so that they can give effective crush on every contact of food and keep the food moving in and out within the crushing track. The SUS301 stainless steel carries outstanding hardness and toughness characteristics that enable the blades to crush any ingredients in the blink of an eye. The Greenis FGR-8800 is the world's first DC powered blender that is NSF certified for Commercial Use. Whether you will use this in your home or for commercial purpose, you will have the confidence, this blender is built to last. It has a full 7 year warranty for home use, and a 2 year warranty on the motor and 1 year warranty on the jar when used for commercial use. The clear touchscreen interface of the Greenis FGR-8800, you have access to intuitive touch buttons leading to powerful functionality. 7 preset recipe programs are available for: Whold Food Juice, Smoothie, Hot Drinks, Sauce, Shakes, Ice Cubes, and Ice Cream. Pulse Function allows for quick start, free blending and easy cleaning. 1-30 minute timer delivers walk-away convenience and 10 speed settings allow for selecting different speed for specific food or result. The LCD display shows count-down time and current speed, making you in control all the time. The integrated vacuum pump is built into the blending lid. It allows you to quickly and quietly draws out the excess air from the blender container before the blending process. The built-in pressure sensor automatically shuts off when the excess air has been removed. It is cordless and includes a rechargeable battery. A good high power blender can break open the cell walls of fruits and vegetables that will allow the nutrients contained within to be more easily digested. At the same time, blenders can cause excessive oxidative damage to the food being blended, and that is where the vacuum top comes in to prevent the oxidation to these valuable antioxidant phytonutrients. This commercial DC powered motor means the Greenis FGR-8800 Blender is capable of pulverizing even the toughest raw vegetables, skin and seeds with ease. 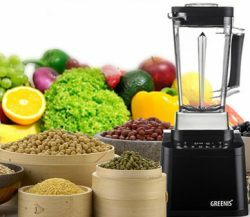 The Greenis FGR-8800 Blender is ideal for health food enthusiasts looking to make whole food smoothies and fibrous juices, plus a variety of dips, baby foods, purees, dressings, soups, nutmilks and ice cream. It will allow you to make even the thickest textures without blinking an eye. The Greenis FGR-8800 power blenders comes with a 2L jar manufactured from Tritan material. Renowned for BPA-free feature, Tritan is also tough and impact-resistant, in thickness up to 4.5mm, resulting in extreme durability and safety.. The jar was designed with blending ridges on the walls that keeps everything in the active blending track while blending all the time so that you will have the finest food texture in the shortest amount of time. 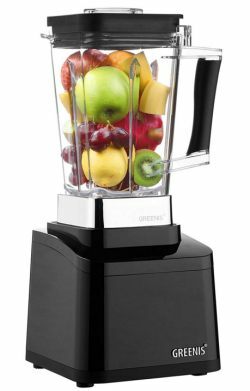 Greenis FGR-8800 power blender features an advanced microchip, equivalent to mounting a �brain� which gives the blender smarter control. In addition, the FGR-8800 includes bluetooth connectivity that allows you to control your blender with your smartphone and download recipes to your Greenis smart blender. The tamper that can be used when the blender is not being used under vacuum can measure the temperature of the food you are blending so you never burn your mouth on your blended ingredients. The Greenis FGR-8800 power blender is able to provide all-around safety protection. Child lock prevents unintended operation. The cup sensor allow the blender to work only when the jar is properly in place to avoid injuries from drive parts. Overheating protection system ensures the security of both users and the device. Why Purchase a Vacuum Blender? 1. Ordinary blenders create greater oxidation due to the air inside the blender when blending. This causes food to brown quicker and diminishes nutrients. Vacuum blending removes excess air and preserves freshness, nutrients and provides a smoother texture. 2. Less Separation, Less Air and deeper, richer color with a smoother texture. 3. More nutrition. Based on testing, certain vitamins and antioxidants may be higher in a vacuum blender due to less oxidation to these fragile life-preserving nutrients.